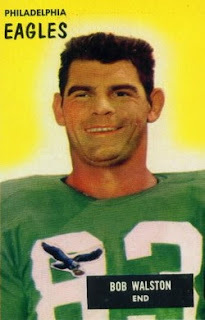 Following a slow 0-2-1 start, the Philadelphia Eagles had put together a three-game winning streak as they faced the New York Giants on November 8, 1953. Head Coach Jim Trimble’s team had an outstanding pass receiving tandem of ends Pete Pihos and Bobby Walston (who also handled the placekicking) and QB Bobby Thomason (pictured at right) had emerged over Adrian Burk as the starting quarterback. Thomason, originally drafted by the Rams and then discarded by Green Bay, started his second season with the Eagles on the bench. The Giants, under long-time Head Coach Steve Owen, were clearly a team in trouble and had a 2-4 record. Injuries were a problem, most notably to FB Eddie Price and members of the defense, and the addition of promising younger players such as HB Frank Gifford was not yet paying off. There was a crowd of 24,331 in attendance at Philadelphia’s Connie Mack Stadium. Two minutes into the first quarter the Eagles scored when Bobby Walston kicked a 15-yard field goal after Philadelphia’s first drive came to a halt at the New York eight yard line. The game moved slowly from that point until the last few minutes of the half. Eleven minutes into the second quarter, Thomason threw a pass that Walston caught behind three New York defenders at the Giants’ 45 and covered a total of 62 yards for a touchdown. Two minutes later the Eagles struck again as Thomason passed to Pihos for a 26-yard TD. Philadelphia took a 17-0 lead into halftime. The Eagles added to their margin in the third quarter, moving 80 yards with Thomason completing five passes along the way including a seven-yard toss to Pihos for a touchdown. The extra point attempt failed, but Philadelphia was now ahead by a commanding 23-0. It became 30-0 in the fourth quarter when Thomason threw a fourth touchdown pass, this time of 13 yards to Walston. Several fights broke out in the final period and three players were ejected in all. The Giants finally scored with six minutes remaining in the game as QB Charlie Conerly tossed a 32-yard TD pass to Frank Gifford to finish off a 74-yard drive. It salvaged pride but nothing else as the Eagles coasted to a 30-7 win. Philadelphia thoroughly dominated the Giants in total yards (514 to 92), although it was the aerial game that made the difference as neither club did particularly well on the ground (64 yards to 54 in favor of New York). The Eagles also had far more first downs (21 to 10), but were also penalized 13 times, at a cost of 123 yards, to three flags thrown on the Giants. New York turned the ball over three times, Philadelphia twice. Bobby Thomason completed 22 of 44 passes for 437 yards and four touchdowns. Pete Pihos caught 7 passes for 145 yards and two TDs and Bobby Walston had 8 receptions for 176 yards in addition to scoring 18 points (two touchdowns, a field goal, and three extra points). Thomason’s passing yardage total was the fourth-best in NFL history at the time as well as an Eagles club record that stood until 1989. The Eagles won twice more before losing to the Giants at New York. They ended up second in the Eastern Conference with a 7-4-1 record. The loss was the fifth in seven games for the Giants who ended up fifth in the conference at 3-9. It marked the end of Steve Owen’s 23-year coaching tenure with the club. 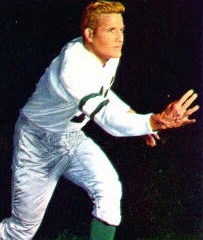 Bobby Thomason had a 329-yard passing game the following week against the Colts (although he also tossed five interceptions) in what was his finest season. He led the NFL with 21 touchdown passes while ranking second in attempts (304) and yards (2462). Thomason was selected to the Pro Bowl for the first of an eventual three times, but his career was marked by inconsistency and he continued to split time with Burk during most of his six years in Philadelphia.